Located on a pristine beach, just minutes from Playa del Carmen, the Sandos Playacar Beach Resort has family friendly and adults only areas. The Sandos Playacar is located in the prestigious gated Playacar community adjacent to Playa del Carmen. Known for its pristine beach, the Sandos Playacar is separated into 3 sections. The hotel has 3 buffets and several menued restaurants. There are a multitude of bars, a wide variety of activities and entertainment as well as plenty of opportunities to lounge around and relax. Only steps from a golf course, with a spa on site, there is something to please everyone at the Sandos Playacar. Riviera Junior Suite KING - Spacious junior suite with a king bed, bunk beds, and a large whirpool tub. Riviera Junior Suite QUEEN - Spacious junior suite with 2 double beds and a double sofa. These rooms are located at the back end of the property, near the main lobby. They have access to their own pools, as well as having several restaurants and bars in this area. Hacienda Junior Suites - 388 square feet in the recently renovated Royal Elite Hacienda Section. One king or two double beds, along with a sofa bed in the integrated living room area. Located in the middle of the property. Each Hacienda has 8 rooms, with a private pool jacuzzi and lounge area for each building. Select Club Superior - One king bed or two double beds in this 334 square foot room. Located in the area between the main plaza and the beach. Select Club Ocean Front - Once king bed or two double beds as close to the beach as you can get. 322 square feet. The Select Club is 18+ and features an exclusive adults-only pool area, access to two premium bars, and an exclusive ocean view restaurant to enjoy breakfast. Experience endless flavors in a casual ambiance. 3 buffet restaurants offer feature International, Mexican and Italian specialties. Enjoy a coffee and please your sweet tooth with a stop into the Cupcake Cafe. Whether you are beach side or by the pool, snacks are available. A multitude of bars are serving up cold drinks and tropical cocktails. Some restaurants require reservations and guests must comply with the dress code in place. Indulge your senses at the Spa offering hydrotherapy, massage, facial and body treatments, steam baths and a beauty salon. 22 treatment rooms are waiting for you. 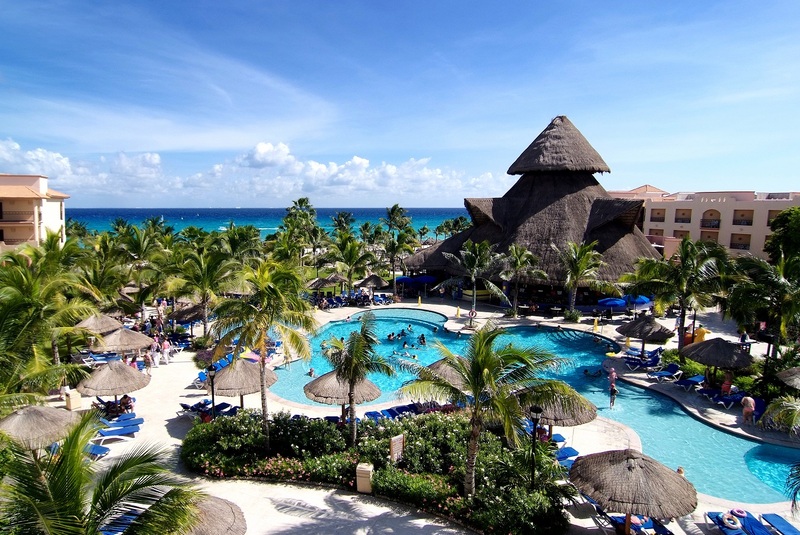 Activities are available for kids of all ages at the Sandos Playacar. While the parents enjoy a little down time, the kids will meet new friends and make memories. Steps from the hotel, the Hard Rock Golf Club awaits. Enjoy these challenging par 72 designed by Robert Von Hagge. Choose a beachfront, gazebo setting or to be surrounded by beautiful gardens for your big day. Wedding coordinators are on site to help you plan down to the last details and make your destination wedding everything you want it to be. Contact us for more information. Planning a family reunion or special group get together? Contact us for special group rates and advantages. Meeting rooms, themed parties, audio / video equipment and group coordinators are available to make your conference a success. Get in touch for your personal group quote.